I can remember the first time I had a rice similar to this when my husband and I were traveling in South America. I enjoyed it so much I tried to replicate it without too much success, it never felt creamy enough like I remembered. Well I finally got it with tweaking a recipe I got from a friend and my own ideas. I hope you give this easy version a try and like it as much as we do. I can't stress enough that the taste of a dish very much depends on the quality of ingredients you are using. If at all possible use fresh parmesan cheese and not the stuff out of a shaker can. If you like the white wine you drink, save a little and use it in the recipe. If you have a bottle of wine you don't enjoy, then don't use it in cooking either, you won't like the taste of it in the recipe. Use a very good quality chicken stock instead of chicken broth. It gives a richer and deeper flavor in soups and in recipes. I like to use Kitchen Basic Chicken Stock if I don't have any homemade stock available, in Winnipeg this product is readily available in most stores. In a casserole dish put in the rice with only 4 cups of the stock saving 1 cup for the end of the cooking time. Remove from the oven and add the remaining ingredients except parsley, stir very well for 2 minutes til it is thick and creamy. Oh boy - this looks so good! 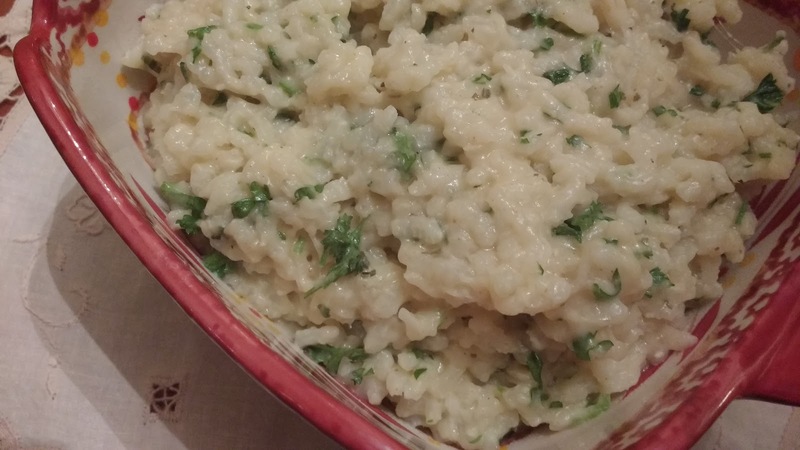 I've never tried making risotto but you make it sound so easy. I've only had Risotto once and it was delish. I always forget about it when I'm at the store. This recipe looks yummy. Awesome! I make risotto often...making it tonight in fact with some organic asparagus...but have been using a microwave recipe I found a few years ago. Not as high maintenance as the stove top way, but this looks even better! I've used the microwave for my quick risotto for years; love it. Going to try this recipe, too, since you don't even need to brown the rice. You certainly can COOK ~ sounds delicious ~ and looks it too! I never try risotto but its sounds delicious. Definitely a perfect weekend breakfast!